E. Coli to The Rescue? 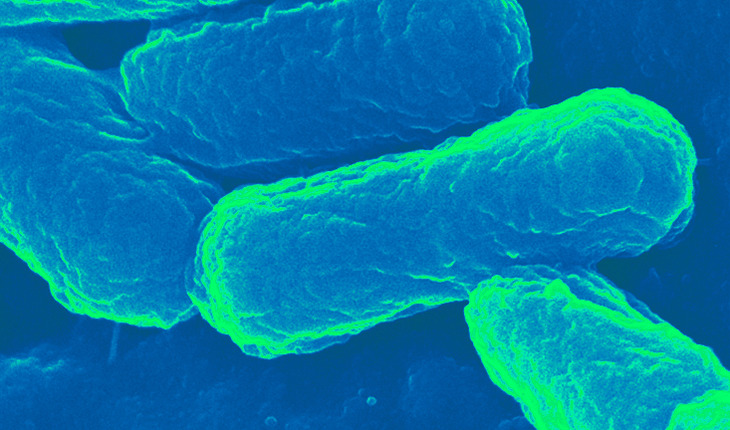 Researchers experimenting with harmless strains of E. coli —the majority of E. coli are safe and important to healthy human digestion have developed an E. coli-based transport capsule designed to help next-generation vaccines do a more efficient job than today’s immunizations. “It’s a bit counterintuitive given what you hear about E. coli, but there are many strains of the bacteria, most of which are perfectly normal in the body, that have great potential to fight disease,” said Blaine A. Pfeifer, PhD, associate professor of chemical and biological engineering in the University at Buffalo School of Engineering and Applied Sciences. The core of the transport capsule is harmless E. coli. A synthetic polymer — poly (beta amino ester), or PBAE — wraps around the bacteria. The positive-charged polymer, combined with the negative-charged bacteria cell wall, create a hybrid capsule. Credit: University at Buffalo. The core of the transport capsule the team developed is harmless E. coli. Around the bacteria, the researchers wrapped a synthetic polymer — called poly (beta amino ester) — that resembles a chain link fence. The positive-charged polymer, combined with the negative-charged bacteria cell wall, create a sort of hybrid capsule. The capsule’s hybrid design provided both passive and active targeting of specific immune cells called antigen-presenting cells that trigger an immune response; natural and multicomponent adjuvant properties, which enhance the body’s immune response; dual intracellular delivery mechanisms to direct a particular immune response; simultaneous production and delivery of the components (antigens) required for a vaccine; and strong vaccination protection capabilities against pneumococcal disease.